Li-Ning Badminton Superstore gets you match-ready with exciting badminton shoes from the minute you step onto the court. We offer an easy shopping and shipping process for our badminton shoes, equipment and apparel. Our large selection of top-selling shoe styles for men, women, kids and children includes a variety of sizes, widths and vibrant colors, with every pair backed by our convenient free exchange policy. After your choice among badminton rackets, selecting your pair of badminton shoes is one of the top decisions any player can make. Properly fitting badminton footwear will not only help to prevent injury, it will also leave you feeling comfortable and confident during the game. When you choose Li-Ning, you are sliding into court shoes that are designed to be sleek and stylish, while also manufactured to exceed the five main quality comparisons you should consider: comfort, durability, support, ventilation and weight. You want a badminton shoe with a soft, supportive insole so your hardworking feet and muscles can not only endure, but excel throughout an entire match by avoiding unnecessary discomfort and fatigue. At Li-Ning, we focus on a comfort fit made from durable innovative materials that cushion your feet and provide the proper court grip. When the competition keeps you on your toes, your ankle needs the appropriate support to prevent injury; that’s why Li-Ning badminton shoes feature the advanced outsole traction of "pavTRAC" anti-slip compound technology. When you’re chasing your next point, or turning on a dime, our shoes offer flexible grip with a non-marking gum rubber sole for superior ankle support, overall performance and control. Li-Ning badminton shoes are breathable with a synthetic mesh upper that keeps your feet cooler, while making the structure lighter as well, with no added weight to slow you down. The standard "TUFF TIP" on the inside front construction provides an additional layer of reinforcement around the toe area to help ensure your badminton shoes last the entire season. Just like you, we’re committed to staying at the top of our game. Forever focused on quality, and always on-trend, our exclusive line of contemporary Li-Ning badminton shoes features exciting new designs available every spring and fall. No two games or play styles are exactly alike, so why wear a badminton shoe that’s one size fits all? At Li-Ning, we offer a wide selection of high quality badminton shoes for men, women and children tailored for your individual size, preferences, and budget. Performance driven yet affordably priced, our line of fashion-forward, lightweight badminton shoes for recreational, club and professional use includes the unique design that’s right for you. Find your perfect fit from dozens of distinctive footwear options for the athlete at any level of play. We offer badminton shoes for the beginner, intermediate and advanced team member, in a variety of configurations, colours and designs, with both standard and wide widths available to choose from. We highly recommend using the shoe size chart at the top of the page as sizing may vary from street shoe standards of measurement. Remember, our free exchange policy makes your selection risk-free: if your shoe isn’t quite right, simply return it in its original condition and packaging and we’ll send you a requested alternate size at no additional cost to you. An official sponsor of the Badminton World Federation, Li-Ning is proud to be the brand of champions. The choice of many of the world’s top players, Li-Ning offers professional grade equipment and attire for advanced comfort, distinctive style and competitive advantage at any level of play. Our badminton shoes are comfortable, supportive and durable. In fact, the higher you buy up the lineup, the more comfortable, supportive and durable they become. If you have sore knees or joints we recommend that you buy the best badminton shoes that you can afford because they may help with your ailments and even eliminate many aches and pains that you feel are related to your badminton play. At Li-Ning Badminton Superstore, you’ll find more than just a great badminton shoe. 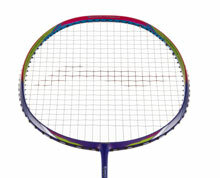 Explore a wide variety of licensed apparel, badminton racquets and bags, training and club level shuttlecocks, nets and accessories online for extraordinary quality at an exceptional price. As one of the largest retailers of the Li-Ning brand in the world, we offer unparalleled selection at unbeatable rates through our online store and authorized dealers in the USA & Canada. Your premier destination for badminton equipment and sportswear, Li-Ning Badminton Superstore also provides electronic restringing services at our Mesa, AZ and Burlington, ON locations. Enjoy your Li-Ning badminton shoes, clothing and equipment even sooner, with most orders placed online received within 3 to 5 business days. As our gift to you, we offer free shipping to the USA and Canada on qualifying orders of $150 or more. Canadian orders with a Canadian shipping address will be charged in $CAD. 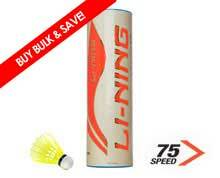 Li-Ning Badminton Superstore is your #1 catalogue for leading edge sports attire, badminton rackets, club and recreational grade shuttlecocks, footwear and accessories, available for purchase online 24 hours a day, 7 days a week. Don’t be fooled by imitations: Li-Ning Badminton Superstore sells only verified genuine, high quality Li-Ning badminton racquets, shoes and custom gear, 100% money-back guaranteed. If you are not completely satisfied with your purchase, simply return it to us within 30 days of the purchase date in new, unused condition and original packaging intact for a full refund. Right style, wrong size? Simply send in your item with your original order number and desired substitute, and we’ll send you a replacement, free. We regret that customized clothing cannot be returned or exchanged. Ready to embrace Anything Is Possible? Call Li-Ning Badminton Superstore toll-free at 1-855-654-6464, contact a live operator Mondays through Fridays 9-5, or send us an enquiry via online form today. Already found the perfect badminton shoe in a size and style you love? Keep in touch! You can choose to receive notifications regarding preferred badminton clothing items when new or updated stock becomes available. Create an account with us for even faster order processing, or visit us in person at a retail location nearest you.